Saarland is one of the sixteen states of Germany. 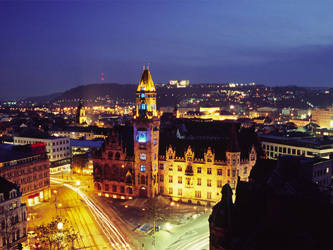 The capital is Saarbrücken. It has an area of 2570 km² and 1,045,000 inhabitants. In both area and population, it is the smallest state in Germany other than the city-states (Berlin, Bremen and Hamburg). Its location on the border between France and Germany has given Saarland a unique history. The Saar did not exist as a unified entity until its creation as the Territory of the Saar Basin by the League of Nations after World War I. Prior to this, some parts of the current entity were Prussian and other parts Bavarian. The inhabitants voted to rejoin Germany in a plebiscite in 1935. From 1947 to 1956 the Saar was a French-occupied territory (the "Saar Protectorate") separate from the rest of Germany. In 1955 the inhabitants were offered independence in a plebiscite, but instead voted to become a state of West Germany. The state borders France (département of Moselle, which forms part of the région of Lorraine) to the south and west, Luxembourg to the west and Rheinland-Pfalz to the north and the east. It is named after the Saar River, a tributary of the Moselle River (itself a tributary of the Rhine), which runs through the state from the south to the northwest. One third of the land area of the Saarland is covered by forest, one of the highest percentages in Germany. The state is generally hilly; the highest mountain is the Dollberg with a height of 695.4 m (about 2,280 feet). A relatively small state of Germany, Saarland is approximately 1,005 square miles. The Hunsrück Mountains meet the Black Forest and the region consists of fertile land as the rivers Saar, Moselle and Blies wind through this area. With such an abundance of waterways, popular river cruise ships beckon visitors to enjoy the amazing panorama. The lakes of Bostalsee and Losheimer See are filled with surfers and sailors. Bicycle enthusiasts are offered over 1235 miles of scenic trails. Celts and Romans settled ages ago in the hillsides and remnants of their beautiful architecture is prominent today. The restored Montclair Castle sets majestically on hill overlooking the Saar. Fortifications of Saarlouis, built by Louis XIV, known as the French “Sun King” are proof of bygone era. Saarbrücken s the capital of the state of Saarland in Germany. The city sits at the heart of a metropolitan area that bounds westwards to Dillingen and northeastwards to Neunkirchen, in which most of the people of the Saarland live. Saarbrücken is over 1000 years old and visitors will appreciate and be amazed at the elegant Baroque architecture. Saarbrücken used to be the industrial and transport centre of a great coal basin. Production included iron and steel, sugar, beer, pottery, optical instruments, machinery, and construction materials. However, over the past decades the industrial importance of Saarland has declined, as the mining industry has become unprofitable. Historic landmarks in the city include the stone bridge across the Saar (1546), the Gothic church of St Arnual, the 18th century Saarbrücker Schloss (castle) and the old part of the town, the St. Johanner Markt. In 1815 Saarbrücken came under Prussian control, and for two periods in the 20th century (1919–35 and 1945–57) it became part of the Saar territory under French administration. For this reason, coupled with its proximity to the French border, it retains a certain French influence. In modern German Saarbrücken literally means Saar bridges, and indeed there are about a dozen bridges across the Saar river. However the name actually predates any bridge at this spot by at least 500 years. The historical name of the town is actually Sarabrucca, derived from the Old High German word Brucca, which became Brocken in High German (rock or boulder in English). Town of Ottweiler was renown as the Nassau-Saarbrücken Procelain factory. Europe’s largest red sandstone caves are located in Homburg. There is a interesting Roman-type open-air museum called “Schwarzenacker” near Homburg. For history buffs, visit the archeological gardens where evidence of an exciting culture existed over 2000 years ago. Ottweiler is a municipality, former seat of the district of Neunkirchen, in Saarland, Germany. It is situated on the river Blies, approx. 7 km north of Neunkirchen, and 25 km northeast of Saarbrücken. The town is notable for the Ottweiler porcelain.